On November 15th opens in Bologna FICO EATALY WORLD! Covering an area of 10 hectares in Bologna (Italy), FICO will embody the wonders of Italian biodiversity through 2 hectares of open-air fields and stables and 8 hectares covered by: 40 Farming Factories, 45 refreshment points, a market space; areas devoted to sport, children, reading activities and services, 6 classrooms, 6 large educational "rides", theatre and cinema facilities, a congress centre accomodating from 50 to 1000 people, a Foundation with 4 universities. Plan your visit and choose your experience! And the entrance is FREE! 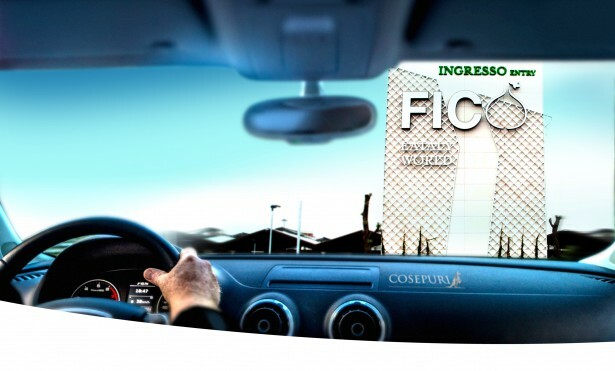 COSEPURI is partner of FICO EATALY WORLD and puts at visitors’ disposal a large fleet of vehicles and speaking English drivers for couples, families, small and big groups, schools, community centres, parishes, etc. Reach FICO on board one of our sedan for up to 4 passengers or book a minivan for up to 8 passengers or ask for a quotation of a minibus or a coach. Our drivers will wait for you or come back and pick you up at the end of your visit. Rely on COSEPURI, the kangaroo that drives you to FICO!